Today wasn’t raining (hooray!) so we decided to get outdoors. As The Boss has never got to Wester Hardmuir yet, we went there to see if we could pick nice vegetables. Yes, it’s more expensive than the supermarket, but as I said before, the extra pays for entertaining the kids. All 3 girls enjoyed picking strawberries from hanging baskets this time. Maxi and Midi Minx even managed to (mostly) pick ripe, red ones. It was Mini who insisted on grabbing or sitting on the greyest, mankiest ones… I stuck her back in the big Peruvian Pan-Piper sling (my beautiful Girasol No. 26) and shamelessly fed her strawberry after strawberry. What the hell – none of the girls had eaten any last time or this time. In a bid to tire out the little blighters, we let them loose on the playpark again. 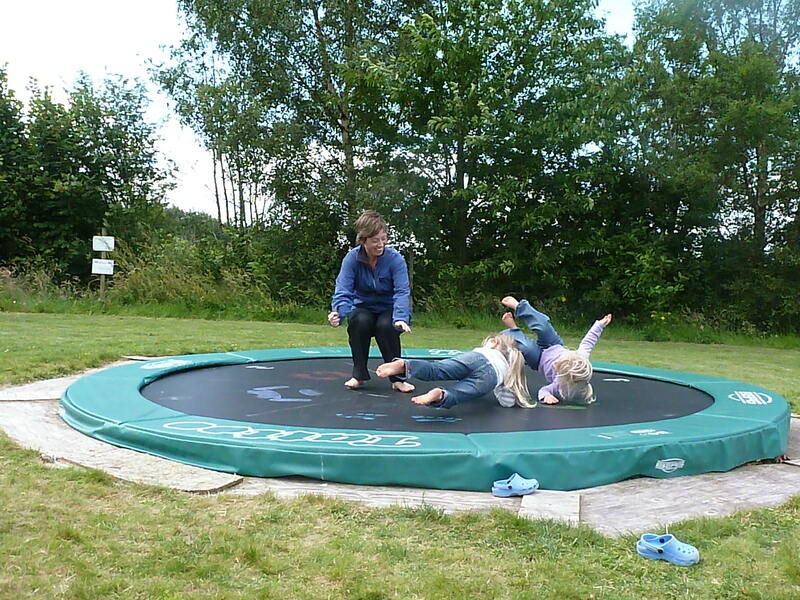 This time, with The Boss here, I could have a go on the trampolines, too. What a hoot! Who needs a gym?! 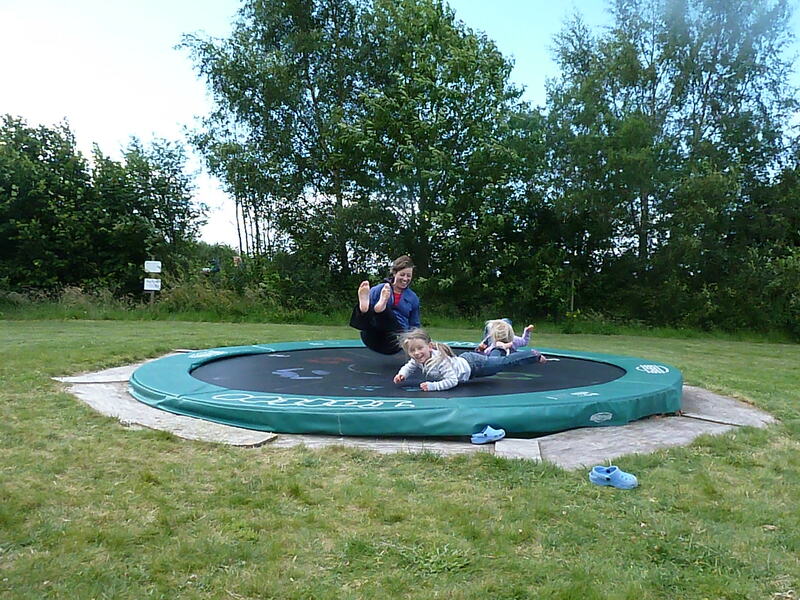 The girls’ favourite game was to lie down and let me bounce them in the air. It definitely made a huge impression on Midi, who declared how much she loved me for hours afterwards. We treated ourselves to Eating Lunch Out (McKenzie & Cruikshanks), but with The Boss barely able to hold his eyes open, he took a snoozing Mini home and I ran the other 2 ragged at the local swing-park. They’re all dozing now. 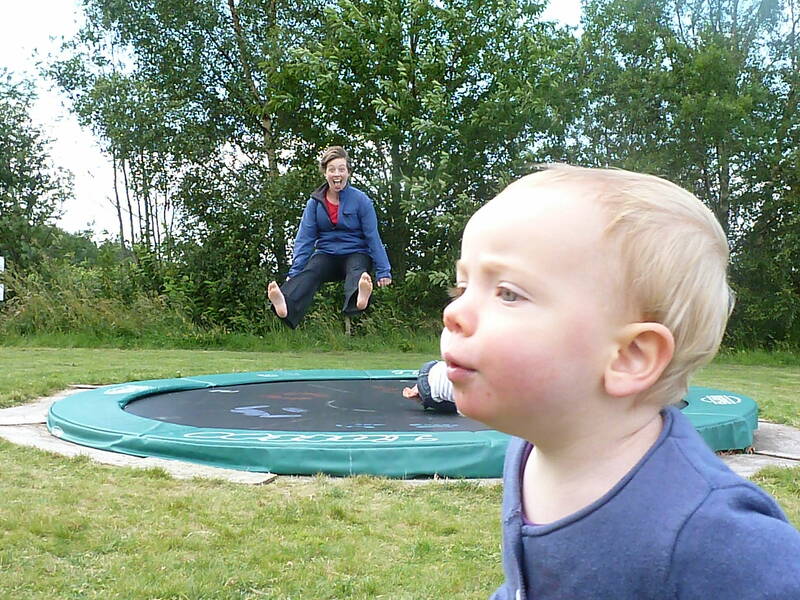 This entry was posted in Out and About and tagged children, PYO, trampoline by GrumpyOldTrout. Bookmark the permalink.